Koodiyattam is the Sanskrit drama performed in Kerala, India. Koodiyattam originated much before Kathakali and considered to be 2000 years old. Kulasekhara Varma Cheraman Perumal, an ancient King of Kerala was known as the creator of Koodiyattam. The way of acting is clearly described in his book "Attaprakaram" which is said to be the most authoritative book on Koodiyattam. Also the acting is based on 'Natyasasthram' which is the most authentic book on almost all Indian Dance Forms. 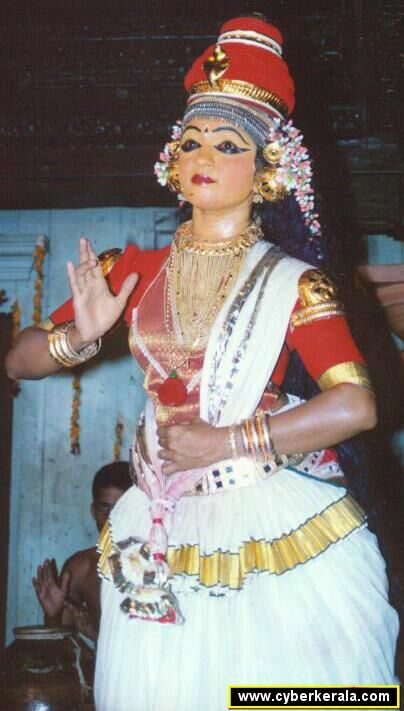 Koodiyattam was the act of "Chakyars" (a subcaste of Kerala Hindus) and it was a rule that all men actors should be Chakkyars and women actresses should be Nangyars (Chakkyar women). The name 'Koodiyattam' (combined dance form) came because it is the combined performance of Chakkyar and Nangyar. The 'Mizhav' which is the drum used for the rhythmic background is beaten by 'Nambiars', another caste in Kerala.